The eldest was Campbell Gentry Miles, Jr. (15 Jan 1924-14 Jan 2006 Huntsville, AL) Gentry’s obituary read: Campbell Gentry Miles Jr., 81, of Huntsville died Saturday at Carington Health Center at Carlton Cove. Visitation will be from 10 to 11 a.m. today at First Baptist Church, 600 Governors Drive. The funeral service will follow at 11 a.m. with Dr. David Hull and Dr. Ralph Langley officiating. Burial will be at Maple Hill Cemetery with Laughlin Service directing. Mr. Miles was born and educated in Nashville. He entered military service in February 1943, was in ASTP at Washington and Jefferson University in Washington, Pa. When ASTP was discontinued, he went to Camp Claiborne, La., to the 84th "Railsplitters" Division. He served in the European Theater of World War II, where he received the Purple Heart and Bronze Star. 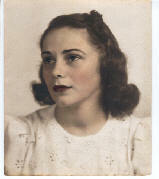 Gentry married Clara Lucille Benedict of Alexandria, La., in September 1945. He then graduated from Vanderbilt University in 1948 with a degree in mechanical engineering. He was a member of the Quing Club. He then worked in the Bureau of Steam Engineering, TSI, in Birmingham. In June 1951, Mr. Miles moved to Huntsville as assistant chief structures task lab to Dr. Wilhelm Rhaitel. Later he became structures task engineer on the first fully assembled Redstone rocket. Other outstanding experiences led to MSFC working for Dr. Ernst Stuhlinger, where Gentry put together the center's Supporting Research and Advanced Development Program each year and "sold" them to NASA headquarters technical staff. The budgets grew from $900,000 to $42, 000,000 because of his efforts. This program supported research of Saturn and future space probes. He worked with several other earth orbit experiments to make initial estimates and schedules, such as Zero G and tethered satellites. Gentry retired in 1981. Mr. Miles was a longtime deacon of First Baptist Church, was a member of the sanctuary choir and taught Sunday school classes. He was member of the Kiwanis Club of Huntsville, 40 year Kiwanian, having served as secretary and Kiwanogram Newsletter editor for 10 years. Gentry was honored as a Hixson Fellow by his Club. Gentry was a member of the Huntsville Symphony Orchestra board of Trustees for 23 years and served as president for two years. He was in scouting for 25 years, having been Scoutmaster at FBC and leading the scouting program to two troops, two Cub Scout Packs and one Explorers Pack. He was troop committee chairman.” He is buried in Maple Hill Cemetery, Huntsville, AL. I do not include information on Lilie and Gentry’s other 2 children, dear cousins, for privacy. Sue Chilton McClure Aldridge married Lamar Aldridge and they had 3 children (further information not furnished for privacy) . After his death, she married his brother, Robins Pharr Aldridge, and they lived in Colorado Springs, CO, until his death, at which time she moved back to Birmingham. Many of the dates for family births, etc. come from the Family Bible of "Aunt Sue", whom my mother loved very much. 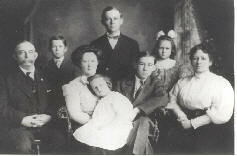 Thomas Hall MCCLURE was born 5 Oct 1858 in Cornersville, Tennessee, was their third child. He died 8 Aug 1921 in Cornersville, Marshall Co., Tennessee. Thomas married Kate. They had no children. Anna Ewing MCCLURE "Amma" was born 1861 in Cornersville, Tennessee. She died 6 Jun 1946 in Cornersville, TN and is buried beside her brother, John Bell McClure. My mother, Jeanne McClure Sanders, remembered Amma, as she was called. She remembered that Amma was one of the first women in Cornersville to regularly harness and drive her own buggy. She was a school teacher; she graduated valedictorian at the Athenaeum, Columbia, TN 1 Jun 1880. My mother also remembered going to the funeral of one of the "great" uncles, William, when she was a child. She knew that one of the brothers was an attorney. Amma never married and is buried beside John Bell McClure in Beechwood Cemetery, Cornersville (now in Marshall County). Their headstones are still easily read. John Bell MCCLURE was born 1869. He died 8 Jan 1921 and was buried in Beechwood Cemetery - Cornersville, TN. John Bell never married. Per the notes of Robert (Bob) McClure, he was in Birmingham, Alabama, when he died upon being thrown from a buggy. ii. Nathaniel Ebenezer MARTIN "Eben" was born 10 Feb 1903. Eben married Grieselda Eva GUTHRIE on 16 Jun 1928. They had two children. Further information not provided for privacy. I haven’t been in touch with their descendants, but would love to hear from them! This effort wouldn’t be complete without special mention of Carl Martin Hames, son of Mary Ann and William Geda Hames. Carl Martin Hames was born 12 Jul 1938. Martin began compiling our family’s history and genealogy years ago. He shared his notes with me, and that started me on this journey of discovery. He was headmaster of Altamont School here in Birmingham. He was truly a Renaissance Man. Martin never married. He died at age 64 on 20 Nov 2002 in Birmingham, AL. The following newspaper article gives insight into what a special man he was. “Longtime Altamont School Headmaster Martin Hames died Wednesday at University Hospital. He was 64. Mr. Hames died from complications related to kidney problems. Mr. Hames had been at Altamont for 38 years, including 11 years as headmaster. He was known for his love of art, history and the good life. Mr. Hames stepped down as headmaster on July 1 and became headmaster emeritus. He maintained an office at the school and helped with art exhibits, college placement, recruitment, development and school and community relations. "I think that Martin would like best to be remembered because of his contribution to educating young people," said Dr. Alex Nading Jr., member of the Altamont board. "That was his life. He was incredibly good at it. He will be impossible to replace." Assistant Headmaster Kim Crockard has served as interim headmaster since Mr. Hames stepped down. Altamont Trustee Jim Barton heads a search committee to select a new headmaster. 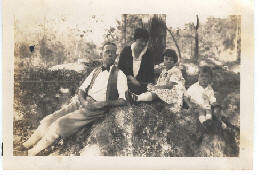 Mr. Hames was godfather to Barton's daughter. "He has been a moving force in education and the arts in this city," Barton said. "He was a tremendous spirit. As an educator, Altamont was probably his masterpiece." Mr. Hames grew up in West End and graduated in 1958 from Birmingham-Southern College with honors in history. His mother, Mary Hames, put a priority on education. Mr. Hames went to college with the help of a scholarship. His first teaching job was at Pratt School in Birmingham. He and his mother traveled and visited Europe often. They toured museums and art galleries, inspiring Mr. Hames to continue his study of art and history. Mr. Hames got his master's in history from Samford University in 1970. In 1980, he obtained a master's of science in education administration. At Pratt School, he began a tradition that continues today at Altamont a holiday reading of Truman Capote's "A Christmas Memory." Several hundred Altamont alumni come for the reading. His thespian talent evolved from college theater and Town and Gown Theater. He taught at Pratt School for six years, then at Birmingham University School, a private school for boys. That school combined with Brooke Hill School for Girls in 1975 to become Altamont. Art was his lifetime passion. Mr. Hames' office at Altamont was wall-papered with paintings. Mr. Hames curated his first art exhibits in the Town and Gown Theater lobby and later began the Town Hall Gallery at Birmingham University School. He was honored in 1999 with the dedication of the Hames Gallery at Altamont given by the Brooke, Comer and Stephens families and EBSCO Industries. Margaret Livingston, a lifetime member of the Altamont board and longtime Birmingham Museum of Art board chairman, described Mr. Hames as a Renaissance man. "Martin has had a tremendous influence on art and the art community," Livingston said. "We're all going to miss him. He's irreplaceable." Mr. Hames is survived by his brother, William G. Hames Jr., of Birmingham. Funeral arrangements were incomplete Wednesday. Ridout's Southside Chapel is directing." Funeral Note: Martin was Episcopalian, but there was not an Episcopal church large enough for his funeral, so the Catholic Cathedral downtown gladly agreed to have his funeral there. They were literally standing outside on the steps...with no room to get into the church, it was so packed. 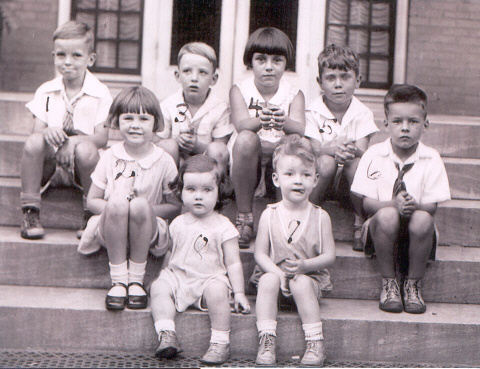 My mother, Jeanne McClure is on the top step, the little girl with dark hair, and next to her on her left, is her brother Bobby McClure. Most don’t look thrilled to have to sit for this, do they? !